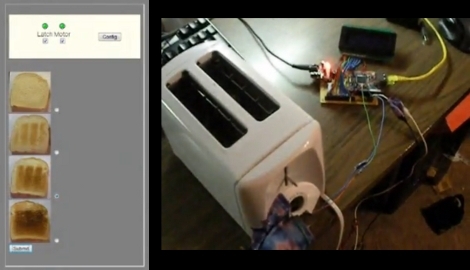 Within a ten-hour window [Wes Brown] threw together this toaster with a web interface for one of his classes. He sourced the WIZnet embedded webserver for the project but this could be pulled off with a homebrew webserver as well. When you point your browser to the correct address you’re greeted with images of bread that have been charred to various degrees. This greatly complicates the act of making breakfast while at the same time presenting a possible fire hazard. Check out the video after the break. Could you provide the link? Pure brillance. I’ve always wanted something like this. I’ve now got a craving for toast. Check out his YouTube tags on the video page. Now, if it can start the toast at a given time, we are set! Put the pop-tarts in the night before, and have ’em ready on your way out the door in the morning. At least its a better use of the Internet than Twitter. Sick, I made it to hackaday! @pyrhho I wanted to have scheduling but I just ran out of time. O.M.G. a twitting toaster.. W.T.F. who Cares not a “Hack” worth anything. It ranks up there with plants that tweet. TWIT devices is what we should call these. Wow, I need to build one !! So I can start it from the bed with my mobile without going out !!! Did you even look at it before commenting? .. what if there’s a flare up? oh wow thats pretty neat… it concerns me though that the motor holds down the lever. should the motor or firmware fail, the motor would prevent the toast release (read: safety mechanism) from springing back posing a fire hazard. throw a feedback switch in there and a relay to kill power to the toaster and that would be a pretty sweet device. How N00bish. I did this back 6 years ago and I copied someone else’s design I found on the net. Using a PIC 16F series and a old product that the Xport people sold that was a embedded web server. I eliminated the useless LCD screen because I chose a toaster with buttons and LED feedback. I was even able to fit it all inside the toaster instead of making it a nasty ugly hack. I’ll see if I can find some of the photos from my old site on internet archive. I was going to make something similar for my A-level electronics project two years ago, but my electronics teacher kept telling me it was a stupid idea and that it had no target market. Now I'd better get some breakfast in bed.